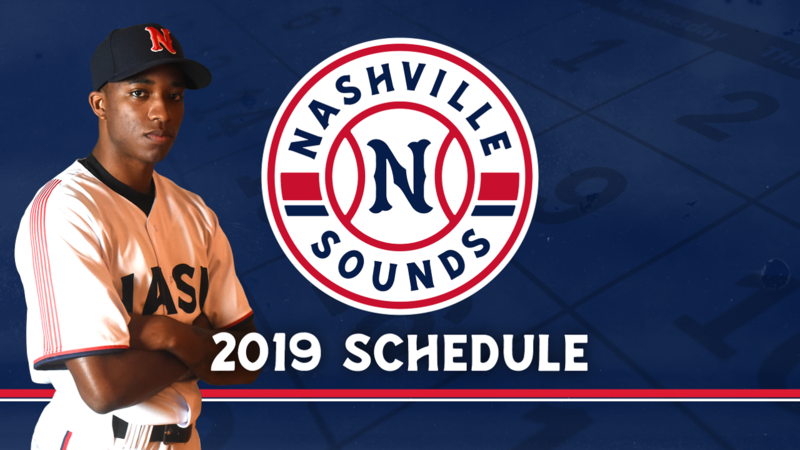 The Nashville Sounds Baseball Club announced today its 2019 schedule, complete with home and away game times for all 140 games. The 42nd season in club history begins at home as the Sounds host the Iowa Cubs on Thursday, April 4 at 6:35 p.m. Opening Day is part of a five-game season-opening homestand at First Tennessee Park. It's the first time since 2016 that the Sounds open the season in Nashville. "As the Sounds enter the fifth season at First Tennessee Park, there is true excitement around the 2019 campaign," said Sounds General Manager Adam Nuse. "The affiliation with the Texas Rangers, coupled with the rebrand has brought positive energy to our staff, and hopefully to the best fans in Minor League Baseball here in Nashville." Following the season-opening five-game homestand against the Cubs, the Sounds travel to Texas for a seven-game road trip against the Round Rock Express (April 9-11) and San Antonio Missions (April 12-15), a new league member which has replaced the Colorado Springs Sky Sox. Notable home games during the 2019 season include Easter Sunday on April 21 (2:05 p.m. vs. San Antonio. ), Memorial Day on Monday, May 27 (12:05 p.m. vs. Round Rock), Father's Day on Sunday, June 16 (2:05 p.m. vs. Salt Lake) and Labor Day on Monday, September 2 (12:05 p.m. vs. San Antonio). The Sounds play on the road for Mother's Day (2:05 p.m. at Memphis on May 12) and July 4 (7:05 p.m. at Omaha). First Tennessee Park plays host to 11 different homestands to fill the 70-game home schedule. The longest homestand of the season is a 13-gamer from May 21 to June 2 when the Sounds welcome the Memphis Redbirds, Round Rock Express and New Orleans Baby Cakes. The longest road trip of the season is a 13-game, 14-day trip to Oklahoma City (May 7-10), Memphis (May 11-14) and Round Rock (May 16-20). The Sounds also embark on a three-city trip in late August as they visit Oklahoma City (August 19-22), Iowa (August 23-25) and Omaha (August 26-29). Nashville will play a total of 22 day games in 2019, including seven at First Tennessee Park. As part of the 2019 Pacific Coast League realignment, the Sounds move to the American Conference's Northern Division. Along with Nashville, the division will consist of the Iowa Cubs, Omaha Storm Chasers and Memphis Redbirds. The Sounds play each team 16 times. The Sounds are offering a Remastered Holiday bundle available now until Wednesday, December 19. Starting at $65, the bundle includes a reserved ticket to Opening Day, an all-you-can-eat picnic buffet on Opening Day, fan choice of any Nashville Sounds Hat from the Pro Shop and a commemorative Sounds Remastered vinyl record featuring music by Krazy Kyle (1 of 500 pressed). A full 2019 promotional schedule will be released in February. Group hospitality areas go on sale Tuesday, November 27 and individual game tickets will be available for purchase in March.